Did the First Americans Take a Ride on the Kelp Highway? 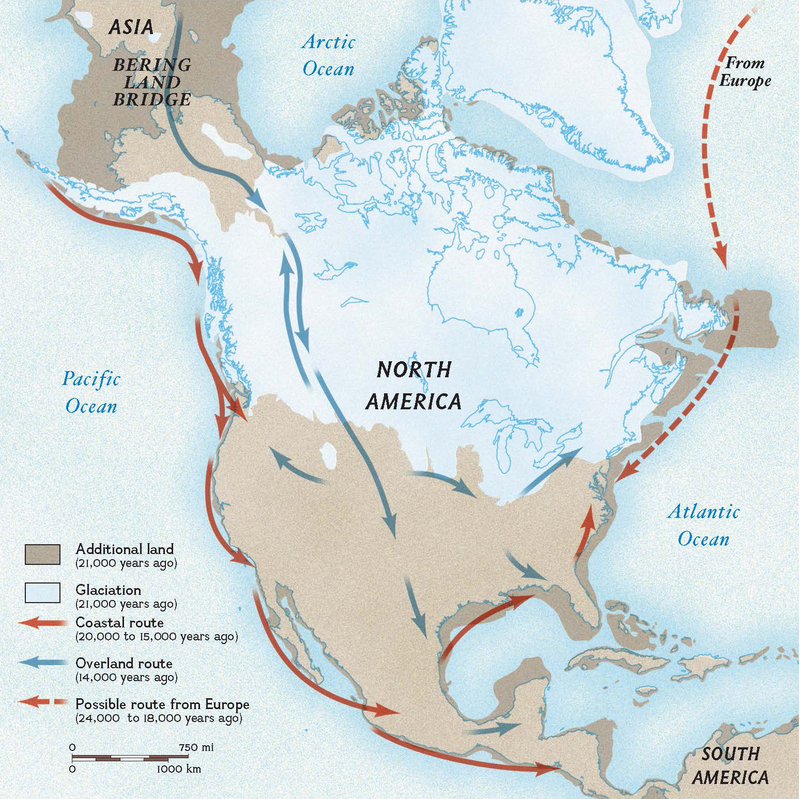 Why did humans migrate to the Americas? Use our activity to explore ancient push-pull factors. The solid red arrows on this map indicate the suggested “kelp highway” coastal route taken by seafaring people from Asia. The blue arrows indicate the older “Clovis-first” land-bridge theory. Archaeological finds indicate that pre-Clovis people arrived in the Americas before 13,500 years ago, likely via the “kelp highway.” The red markers indicate the shape of projectile points found at the associated sites. 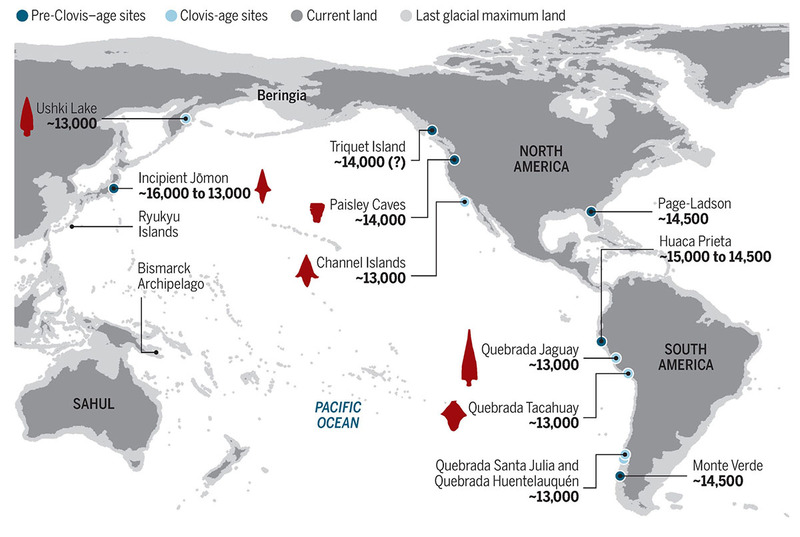 The “kelp highway” theory has nearly displaced the “Clovis-first” theory about how the Americas were populated. What is the Clovis-first theory? As its name implies, the Clovis-first theory suggests that the ancient Clovis people were the first humans to settle in North America (and, later, South America). The Clovis people, named after the town in New Mexico where their characteristic tools were first identified (take a look at those here), were nomadic hunter-gatherers who arrived in North America by crossing the Beringia land bridge about 13,500 years ago. (Learn more about Beringia here.) There, Clovis people and their descendants hunted large game and spread rapidly through the New World. What is the “kelp highway” theory? The kelp highway theory suggests that the first Americans arrived not by land, but by sea, following the coastline of the Pacific Rim of northeastern Asia and Beringia to as far south as South America. Learn more about the kelp highway theory here. The kelp highway is always a busy thoroughfare. Look at that biodiversity! 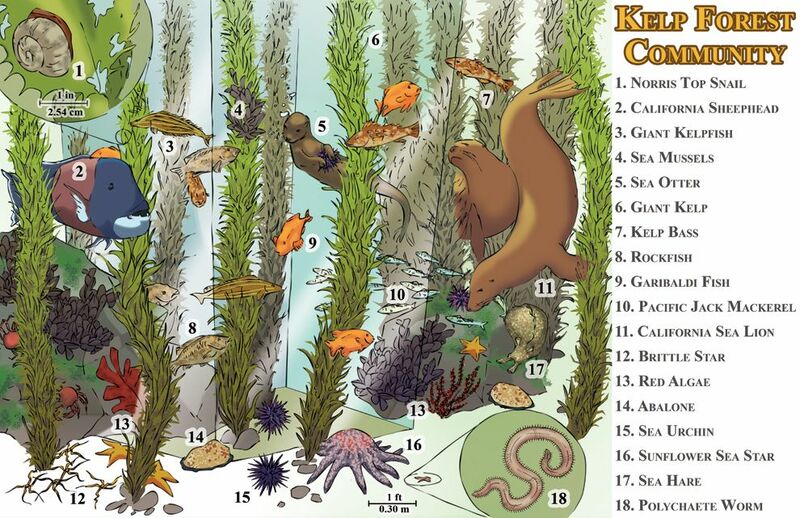 Click here for more labeled and unlabeled illustrations of kelp forests and other marine ecosystems. Why do anthropologists call this coastal route the “kelp highway”? 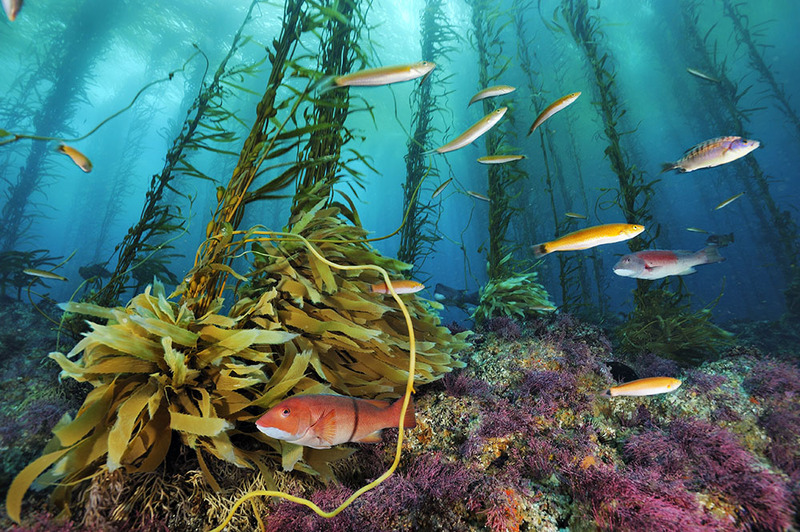 Kelp forests support not only their namesake algae (learn more about kelp here!) which can be an excellent source of nutrients itself, but fishes, marine mammals, sea urchins, sea stars, crustaceans, and mollusks. Kelp forests and mangrove swamps are still important fisheries today. Why is the kelp highway theory more accepted than the Clovis-first theory at this point? If most anthropologists agree, why hasn’t there been abundant evidence for the kelp highway theory? Sea level rise! “Testing the kelp highway hypothesis is challenging because much of the archaeological evidence would have been submerged by rising seas since the last glacial maximum about 26,500 years ago.” The most promising sites may still be underwater and under meters of seafloor silt. Lesson: We need more underwater archaeologists! Previous Previous post: Talking Evolution: Are We Still Evolving?